Jim and Becky Durkin are born and raised Rhode Islanders – and proud of it. Their story begins at URI, and continues today a stone’s throw from where they first met. Jim is a third generation owner of Durkin Cottage Realty in Narragansett, and Becky grew up in Barrington and moved to South County to attend URI. They have been successfully working together for almost 30 years. Jim grew up in the hospitality business, and The Break Hotel is the pinnacle of that experience. What was the inspiration for The Break? 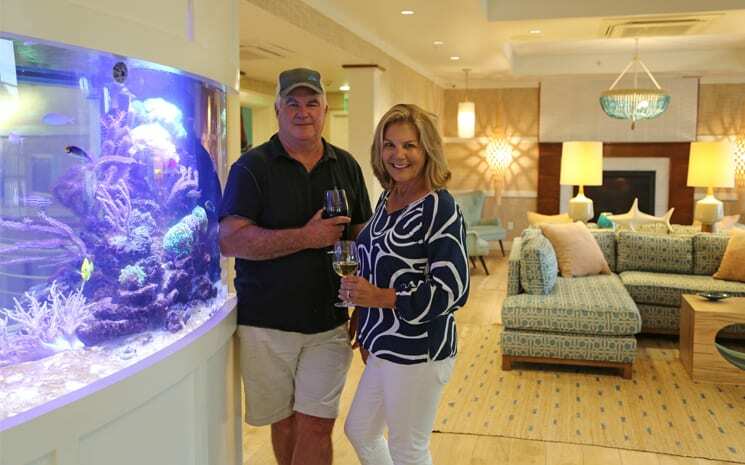 The couple took on the hotel project with the mindset, “It’s just like building a big house.” And, that’s exactly how it feels at The Break, like the most beautiful beach house you’ve ever stayed in. They wanted to create a special experience in Narragansett that is authentic to the town itself. The town’s original surfers gave it its original charm, so the Durkins collaborated with local surfing legend, Peter Pan, on the hotel’s look. His original photographs, hung all through the hotel, provide guests a 1960’s surfer vibe along with the hotel’s luxury seaside appeal. How would you describe The Break experience? The hotel captures the essence of Narragansett. It’s just how Jim and Becky imagined it when they started construction in June of 2013. The feel is fresh, making guests feel at home and reflecting Narragansett’s natural beauty. 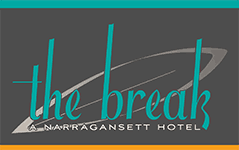 They are proud that The Break acts as the door to Narragansett and attracts guests from around the country. How long has The Break been in business? The Break’s doors opened in June 2015, and it has been a great ride ever since. The hotel has become a destination in itself, as it is the town’s only boutique hotel. It’s authentic Rhode Island inside and out – created by locals and decorated by as many Rhode Islanders as possible. To name a few: Tracy Glover, a graduate of Rhode Island School of Design, crafted statement glassworks for the hotel’s restaurant, Chair 5, Chris Wyllie, a native of Pawtucket, is responsible for The Break’s paintings in Chair 5, the restaurant, and Susan O’Donnell, a local artist, creates elegant prints from real fish, which are displayed on the fourth floor lounge. Does The Break have a restaurant? Yes! Chair 5 is located on the top floor of The Break as well as the main floor. Jim says a hotel without a restaurant is not a hotel at all, but just a place to stay and Chair 5 has become a quintessential part of The Break. Giving the hotel a unique charm with its local seaside inspired menu, Chef Tyler Demora carefully selects provisions from as many local farms as possible and the year-round panoramic rooftop view provides a place for locals to enjoy year-round, something critically important for the Durkins. What should guests do during their stay in Narragansett? Jim and Becky genuinely love what their hometown has to offer. They encourage guests to explore the town – places like the Point Judith Light House, Narragansett Town Beach, The Fishing Village of Galilee and The Pier are among their favorite spots. Each day, The Break is fueled with people from different places, celebrating different occasions, each offering a unique charm to the hotel’s atmosphere. The Durkins are thrilled with each new guest at The Break, and have a passion for providing them with fun and memorable experiences. The Break is a beautiful way to explore Narragansett, and the Durkins and hotel staff are happy to share the beauty of their hometown.